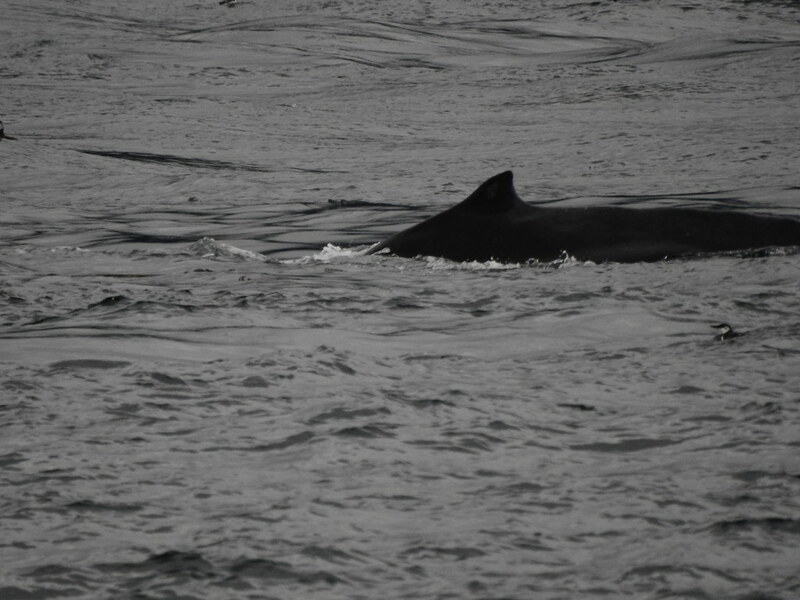 In this first video, we can see the Pacific White-sided Dolphins coming at the Orca from all sides. Jackie sees this behaviour a lot. 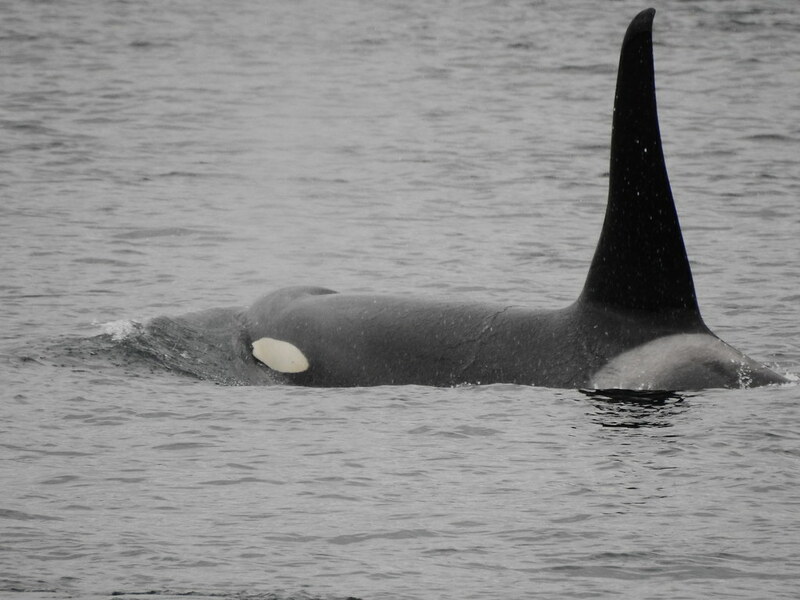 The passengers are calling the Dolphins brats, & criticizing them for swarming & pestering the poor Orca, but as Jackie explains, who are we to judge Nature when we don*t like what we are seeing. Nature is perfect, & everything done is for a good reason. Listen, here she is, explaining it much better. Too bad i stopped the video too early. 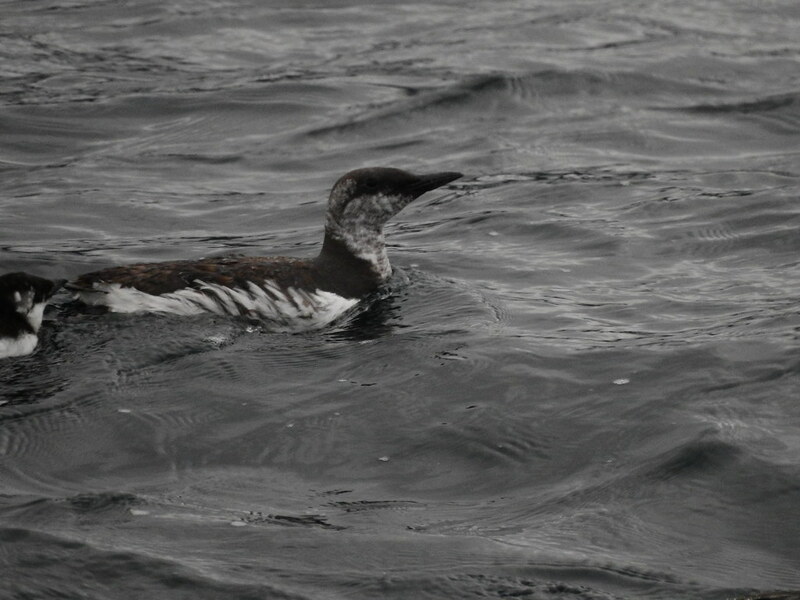 Oh, yay, here is a Common Murre father with his chick following behind. i am trying hard to capture footage of these sweet Birds. i really really want to capture the lovely calls they make to each other! A very shaky video, i am hoping to catch the calls! i*m not quite sure who is who in this foto, as far as fathers or chicks. miigwetch for sharing it all with us!! Very nice to see what you saw, booni! 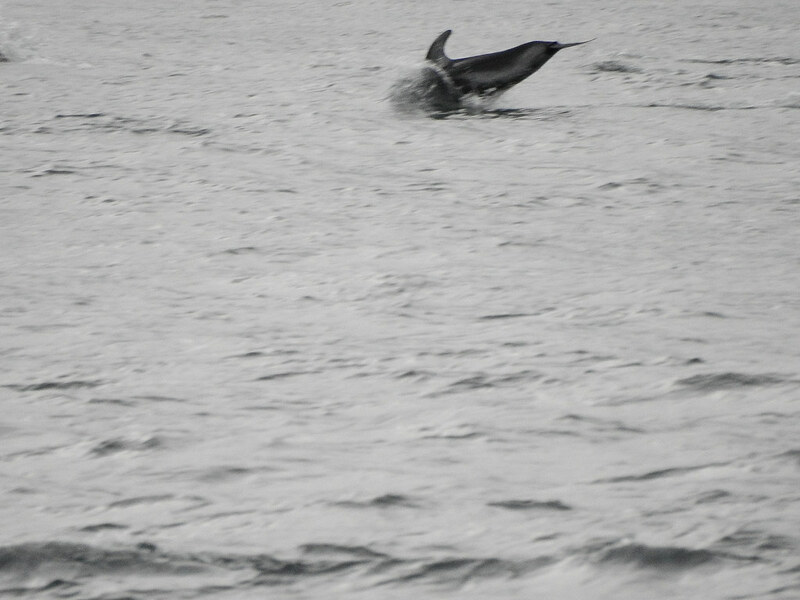 i managed to catch a Pacific White-sided Dolphin leaping! 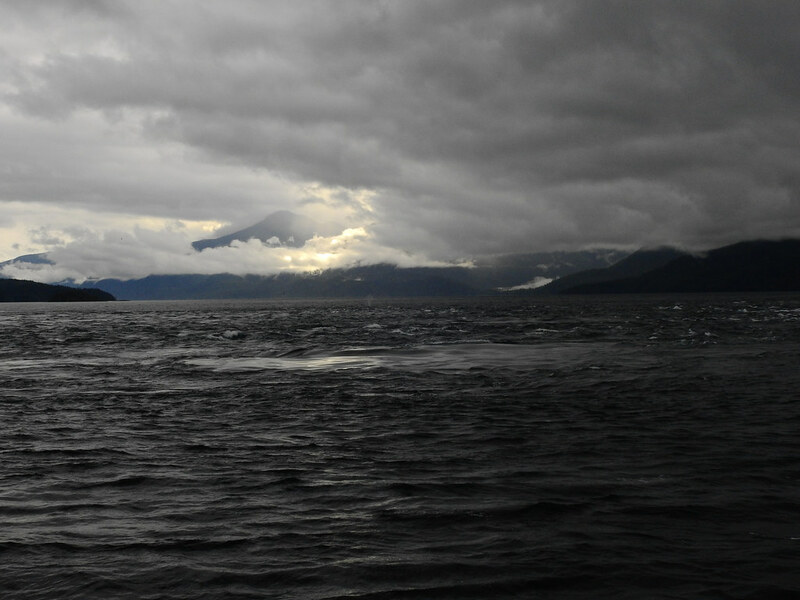 Our lovely setting, with a Humpback blow right in the middle of it. The water in these fotos that looks so calm is actually upwelling of water from way down below the surface, which is what brings all the feeding activity to this area. 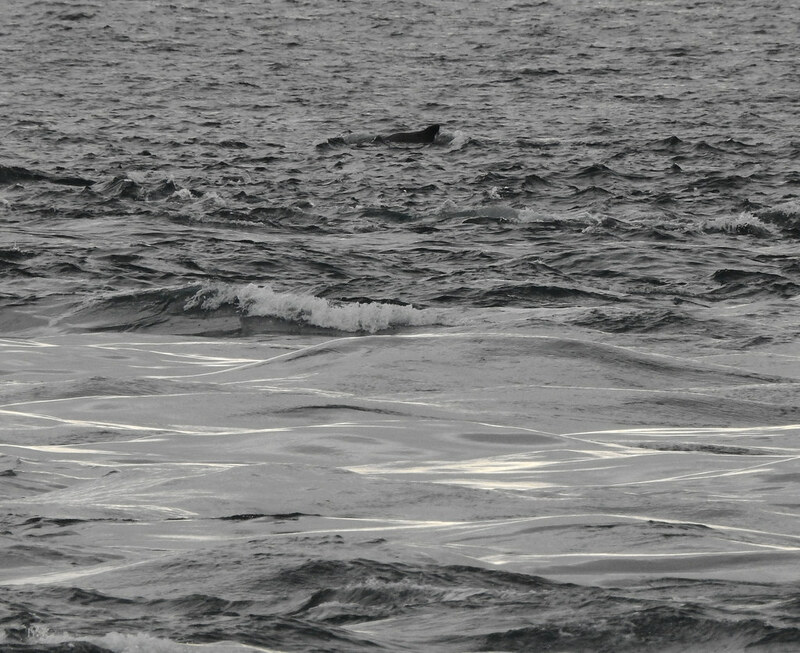 i managed to catch a Humpback surfacing, before they slipped away again. 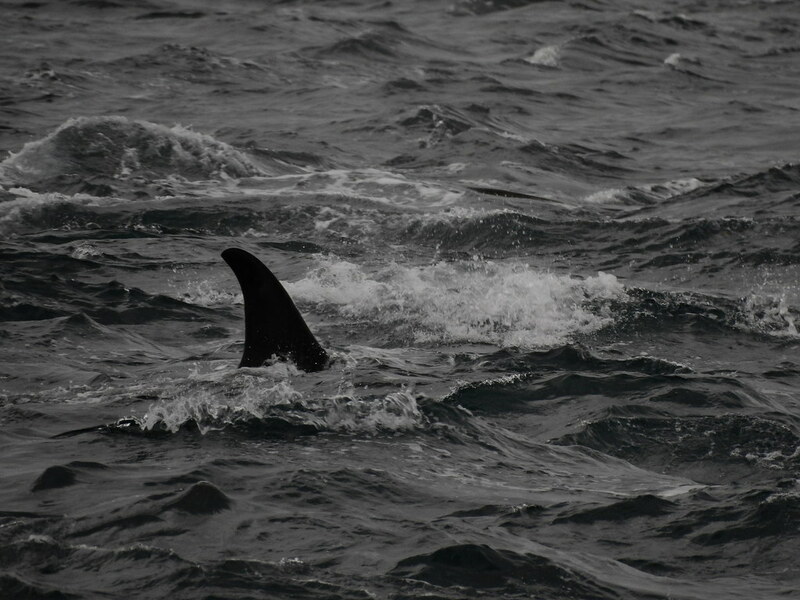 & a Humpback tail as they dove down! 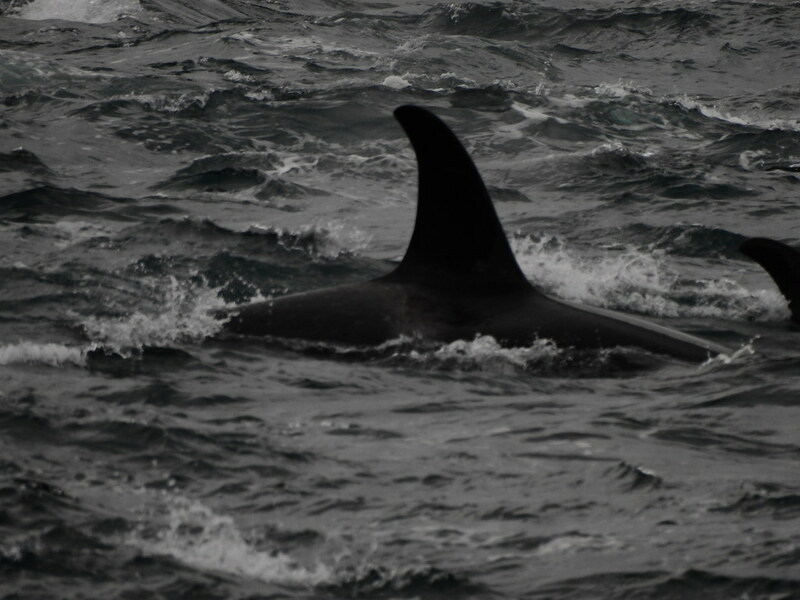 & an Orca, you can see their saddle patch in this one. 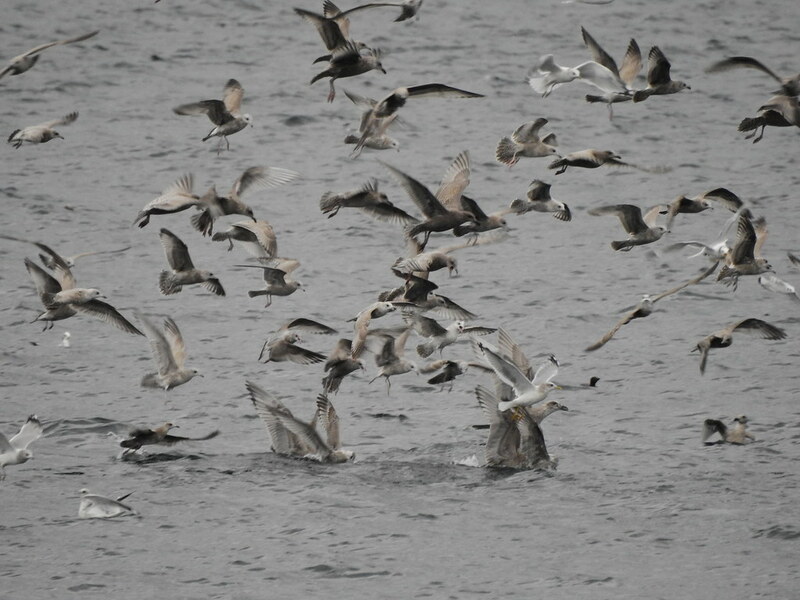 We are told to watch for these gatherings of feeding Gulls. 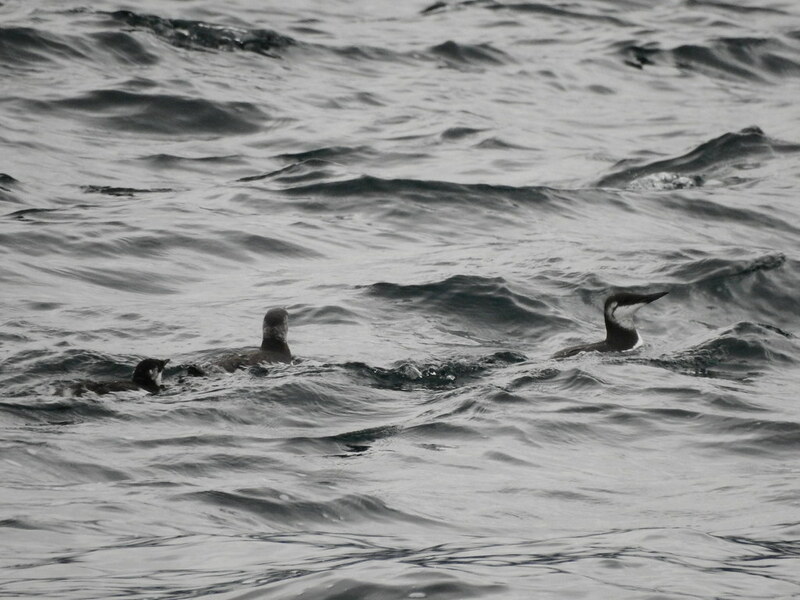 There is likely a feed ball below them, being corralled by the Common Murres. 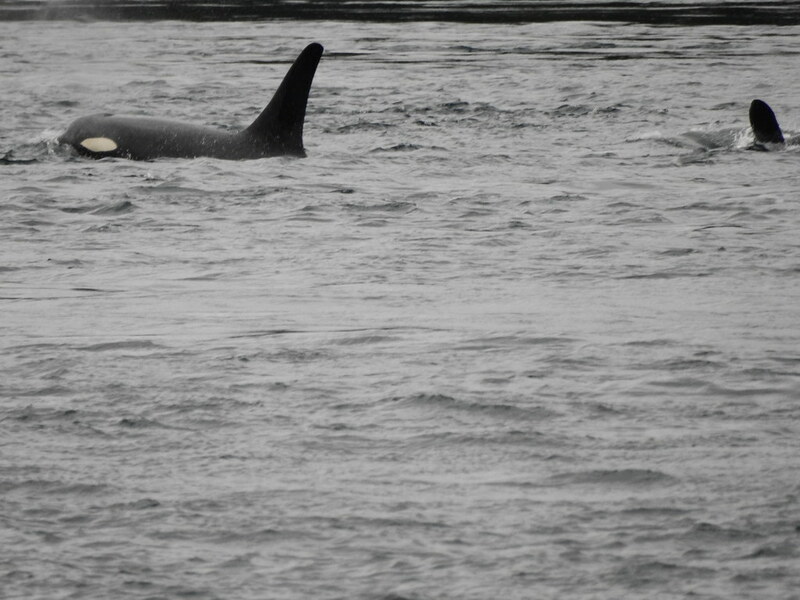 You can hear Jackie announcing the arrivals of the other characters, the Orca & the Dolphins. 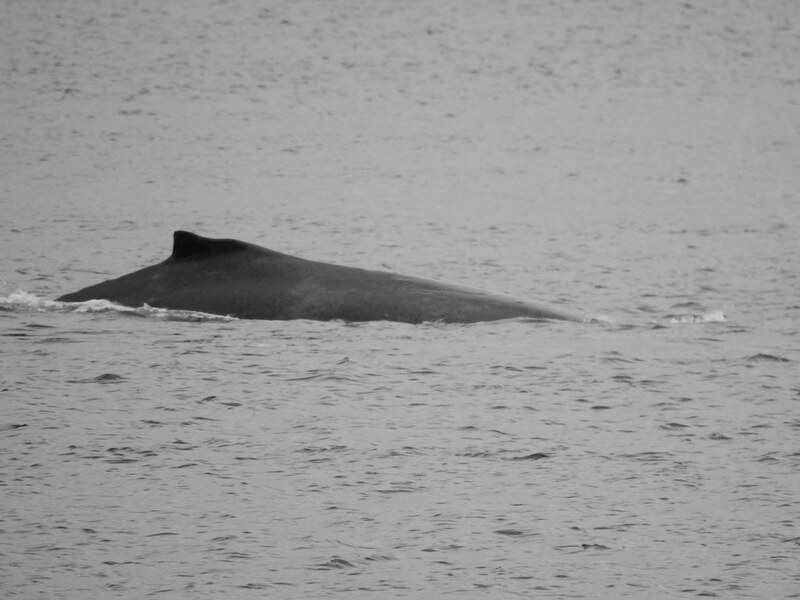 This is a time it is often that you will see a Humpback lunge feeding. They lunge themselves through the bait ball with their mouths wide open. You can hear Jackie announcing as the cast of characters arrive. i am hoping to catch lunge feeding! 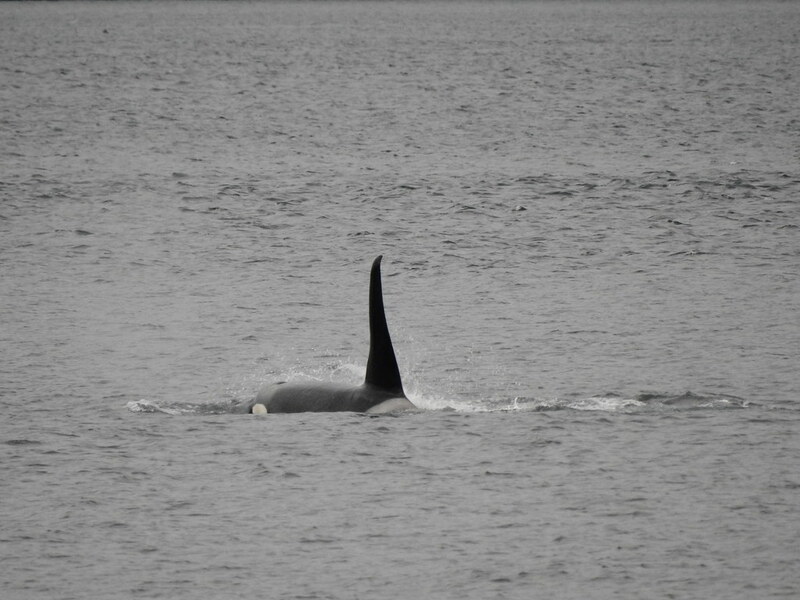 Jackie seemed to know this fella, who is arriving in his boat at Orca Lab. He has a ladder on board. Is that for getting from his boat to the shore? i don*t really see a dock here. & i was sure there were great big glass windows on this building, that i don*t see here. 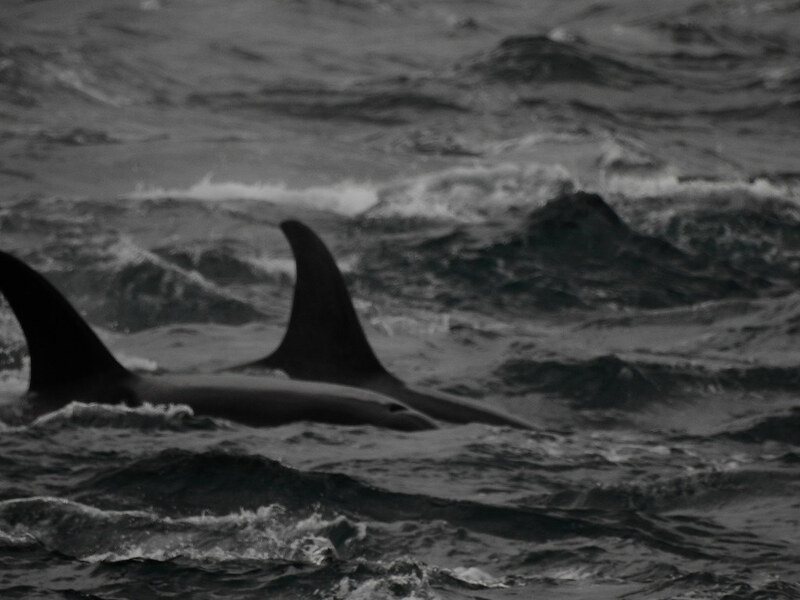 i like the roiling water, with the black black fin here. Oooo, caught a blow hole here. 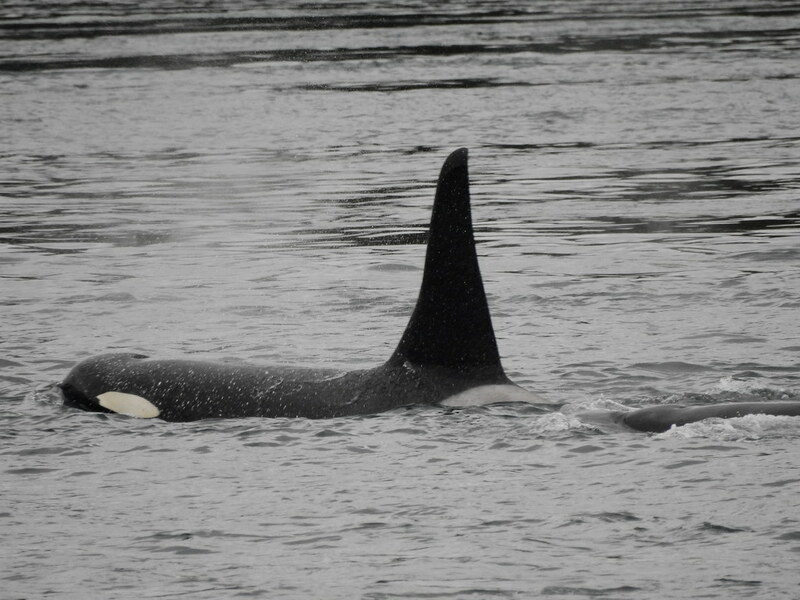 The dorsal fin on the right has some nips out of it that i bet make this individual identifiable. 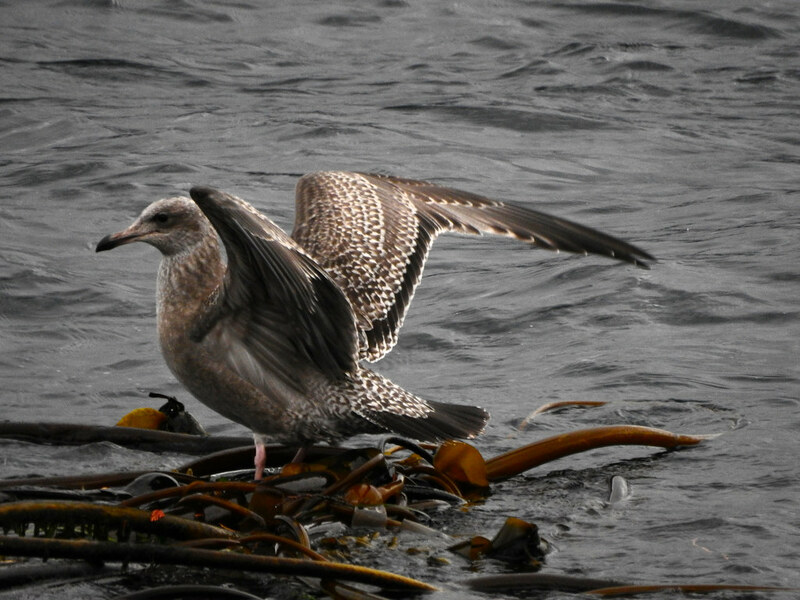 Jackie says - Even though this is a right side and there is no saddle patch visible, because I know which matriline of Northern Residents we saw, it is very likely A96. 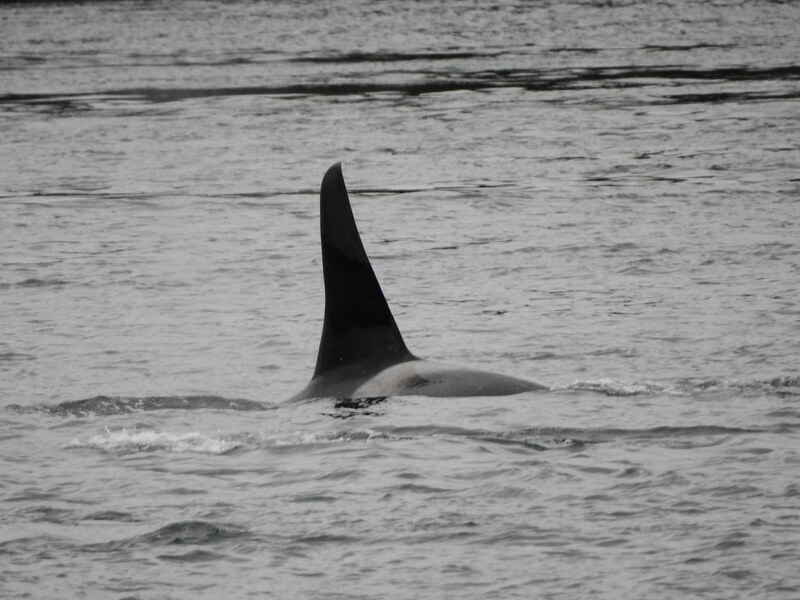 BUT could be A107 as they have very similar shaped dorsal fins. Ooooo, this is exciting, i have caught the eye patch! 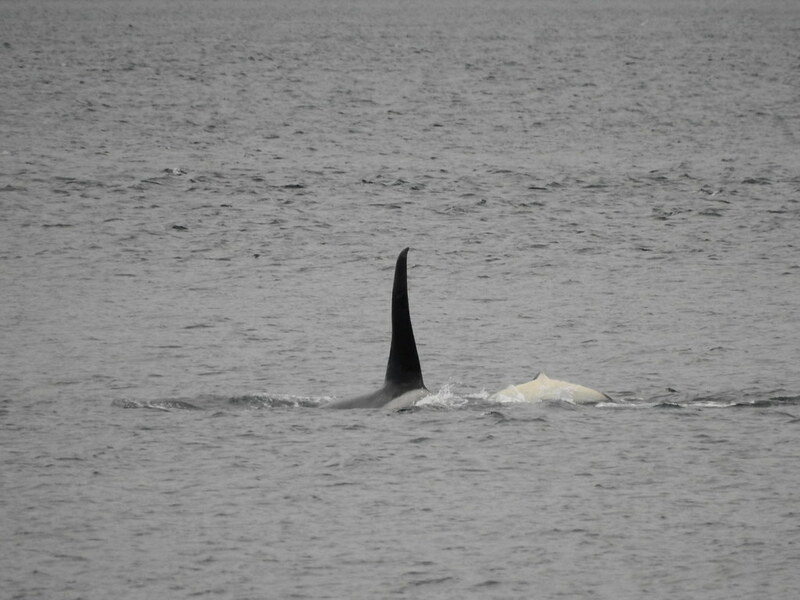 This patch is a bit pinky orange, so perhaps a younger Orca? 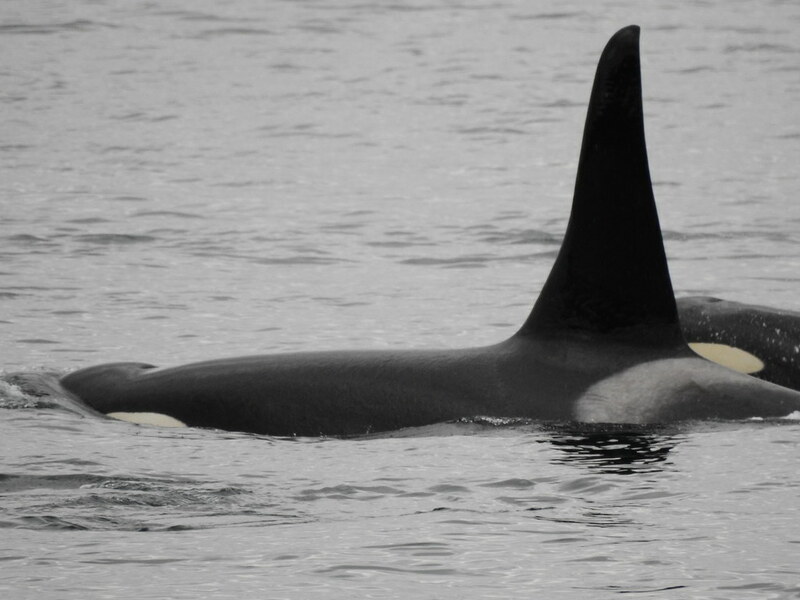 i read somewhere that the younger Orca show this colour on their white eye patches because there isn*t as much blubber between their blood system & their outer skin. Sneaking out of my picture, but cool anyway. i must have gone clickety-click-click on the shutter here. The wind must have been from the right. See the blow still hanging in the air to the left of the blow hole. Ohhhh, this is a nice one, look at the beautiful saddle patch! i*ve asked Jackie who this one is. Jackie says - A55 - Echo. Ahhhhh, here are the windows i remembered. There are sliding wood doors to cover them when no one is there. There is a driftwood sign that says Cracroft Point. & when i was trying to read this zoomed in, i realized there is the fella, behind the sign in a ball cap working in some kind equipment box or cooler. & a black coat hanging off of the stairs railing. 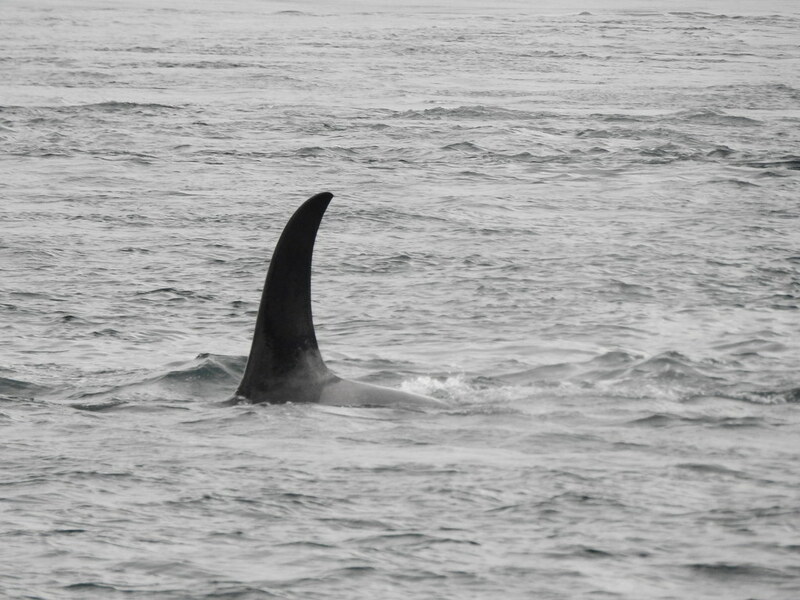 That Orca probably is a male (straight up dorsal fin). 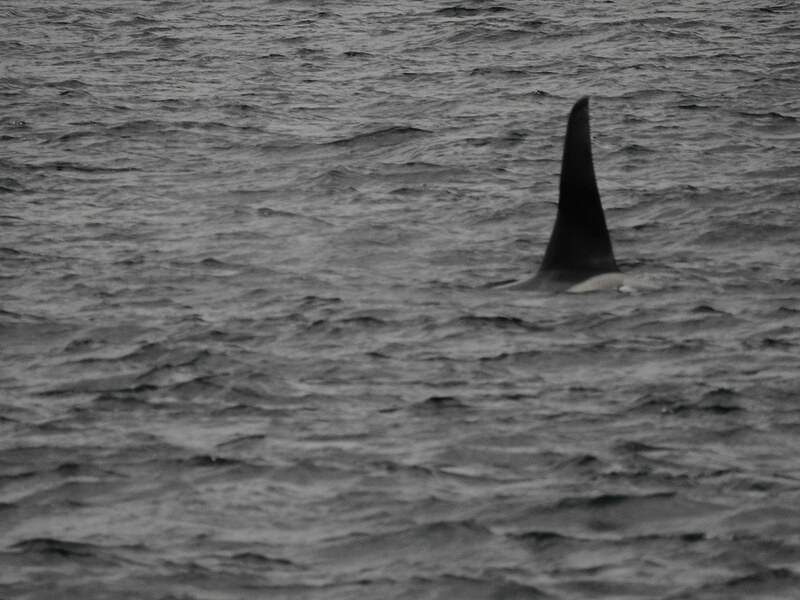 Females have a concave-shaped dorsal fin. i dunno if this*ll work for people, but worth a try. 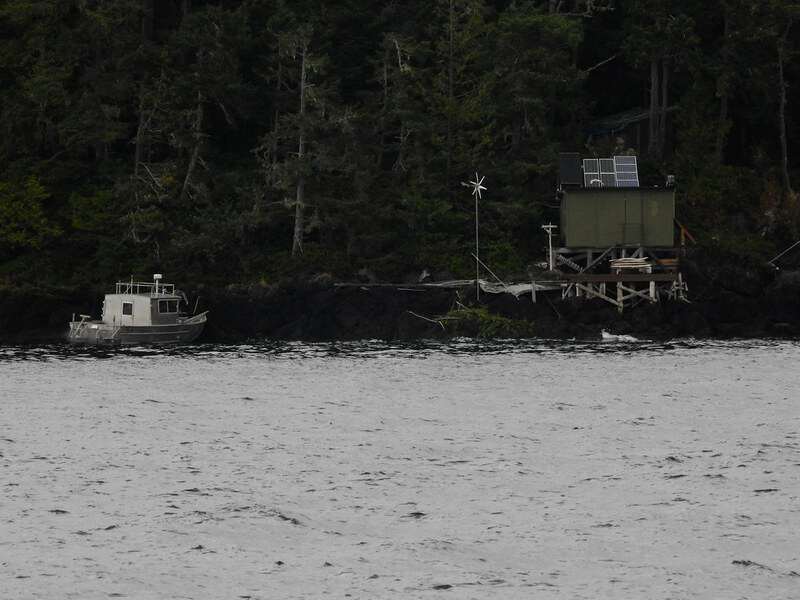 This is a video of the Hanson Island Sea Lion haulout that we kept passing on our boat trip. Be sure to have your volume on! Noisy sea lions! 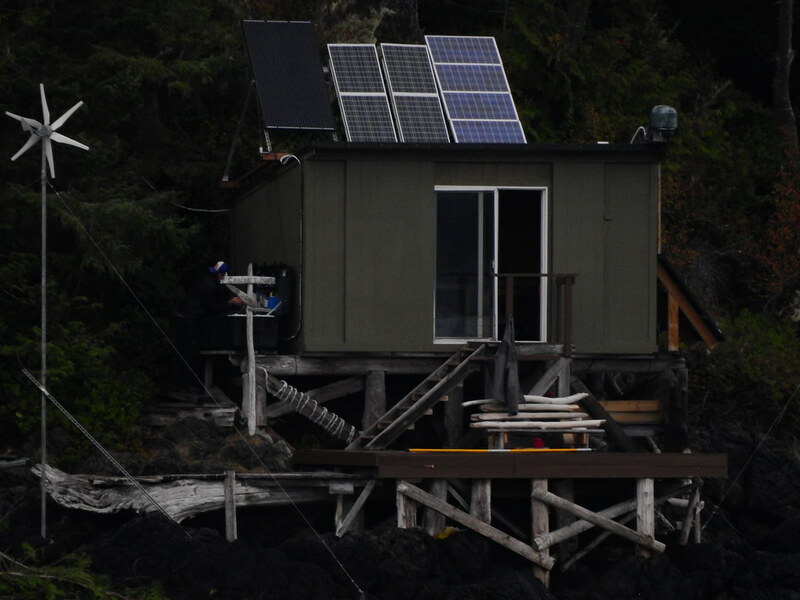 Hang out with this colony on their favorite haulout, live from Hanson Island, BC at OrcaLab HQ. 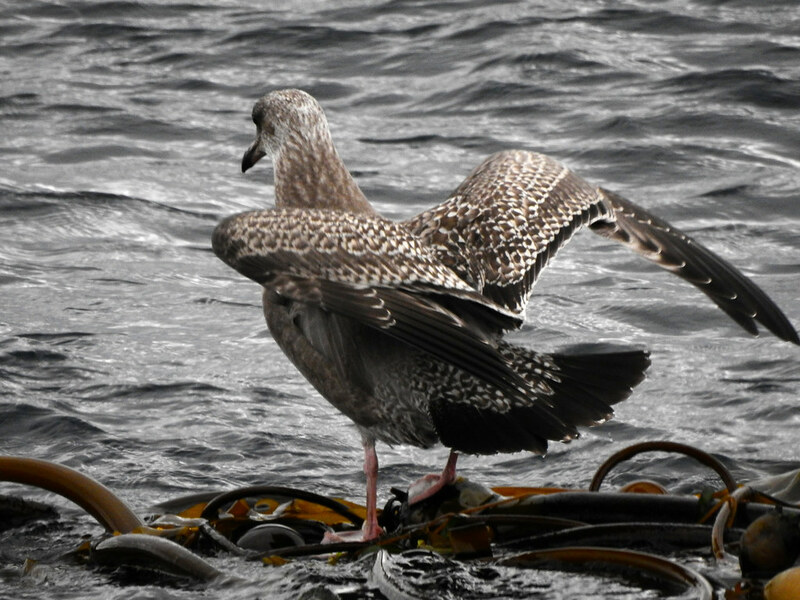 Okay, i am losing confidence in my photographic ability, so i practice on a Gull bobbing along on top of Kelp! 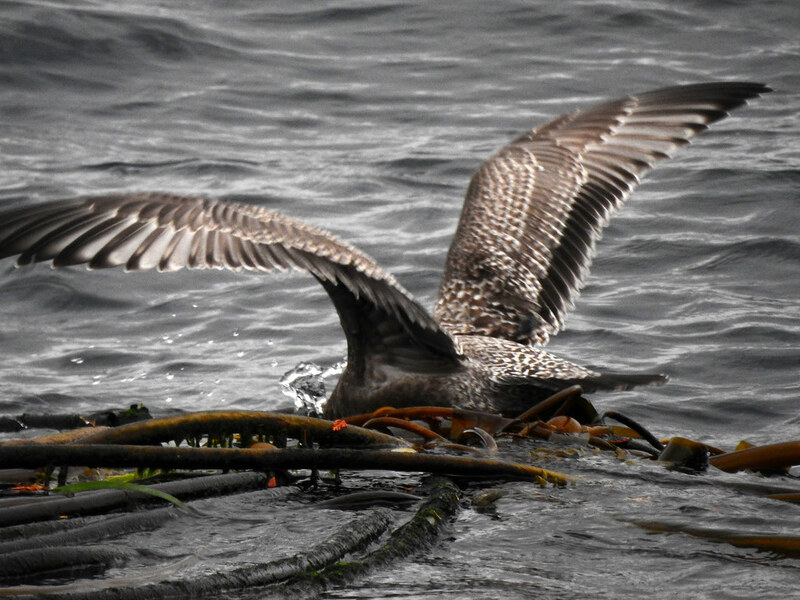 It was nice to see Kelp again, & an abundance of it. On Hornby, we don*t see it much any more, once in a while pieces washed up on the beach is about it. Head is diving for something here, notice the water sploosh where the head has disappeared. 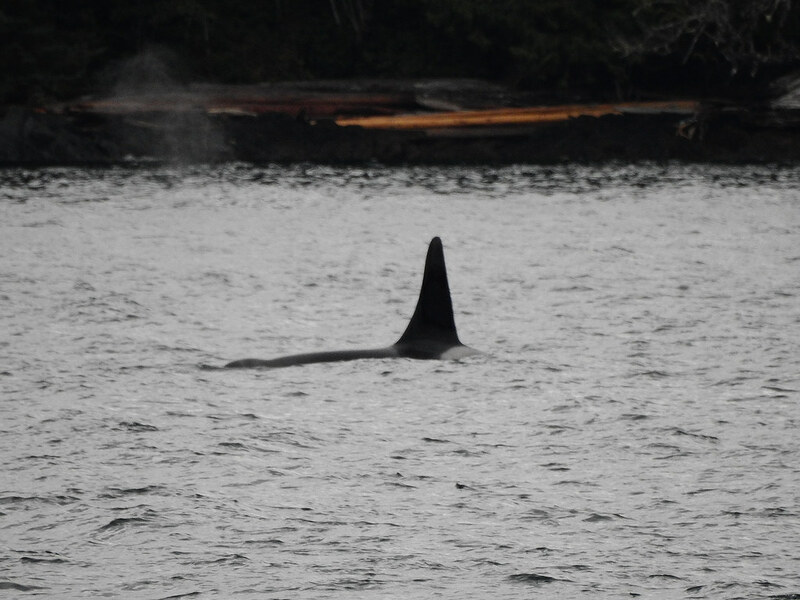 Okay, we have arrived at an Orca & Humpback hotspot! i get lots of practice getting fotos here. There was lots of action i only caught with my eye, i didn*t get there in time with my camera. 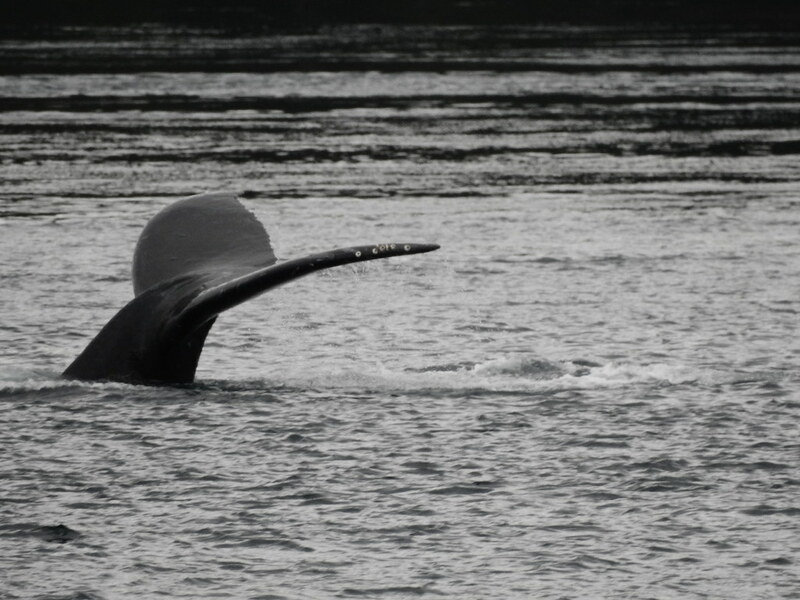 i remember seeing the white underside of a Humpback pectoral fin waving at me for the longest time. 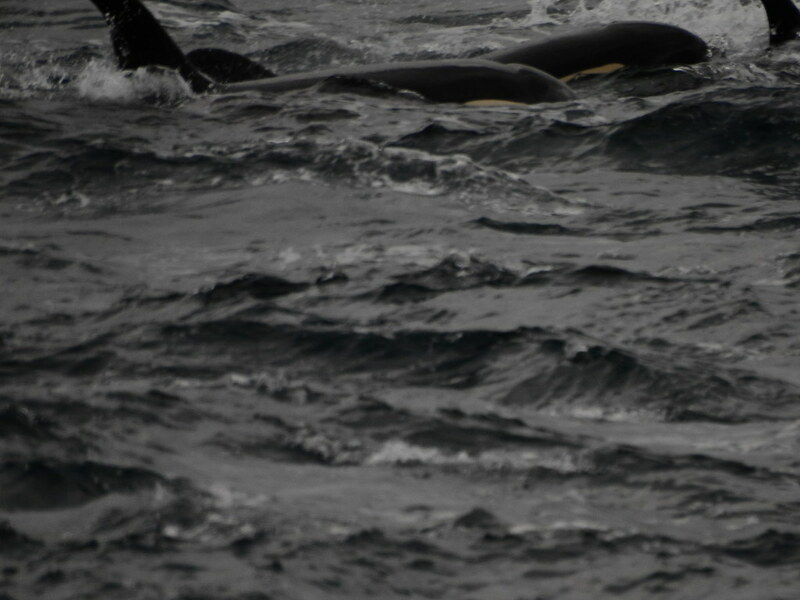 Here i have caught an Orca surfacing to the left & i believe a younger one*s small pectoral fin as they flip sideways to come to the surface. 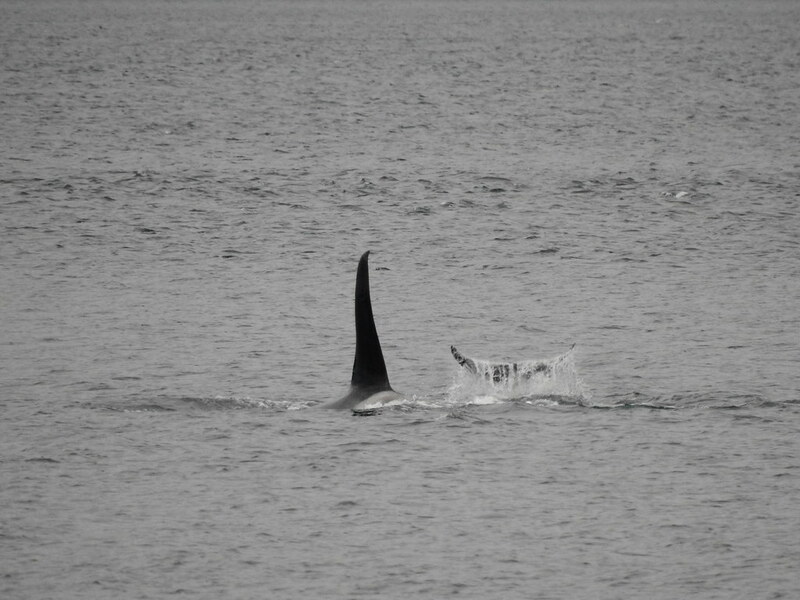 Here i thought i*d caught an Orca carrying a Salmon in their mouth! 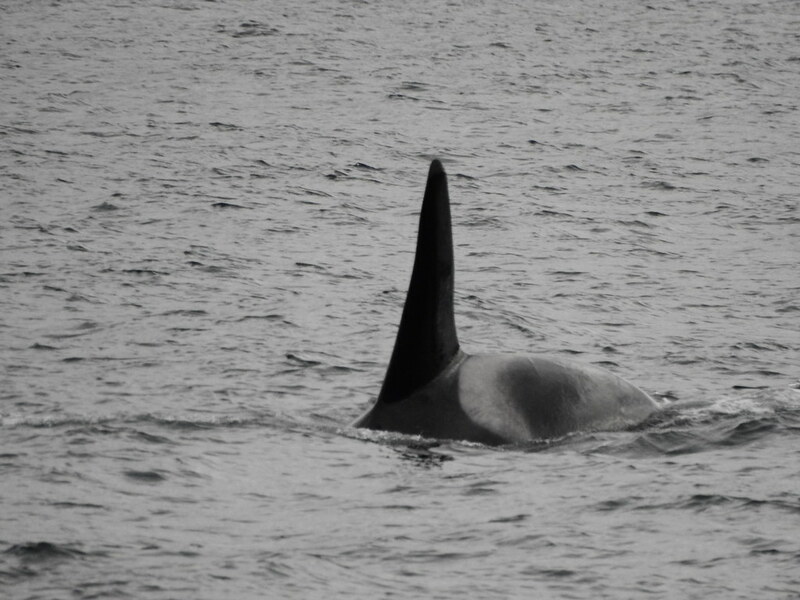 i showed Jackie & she was quite excited, thinking this was some interesting behaviour, but when i sent her the fotos she decided it was just the bow wave of the Orca. i have a whole clickety-click series of this time, & there is something dark there in every foto. To me it looks like more than just a shadow of the wave. Two surfacing here, one just showing to the right. Two here, & i asked Jackie about the scratch marks across the dorsal patch on the one out front here. She said - Normal injuries of life (some are rake marks). 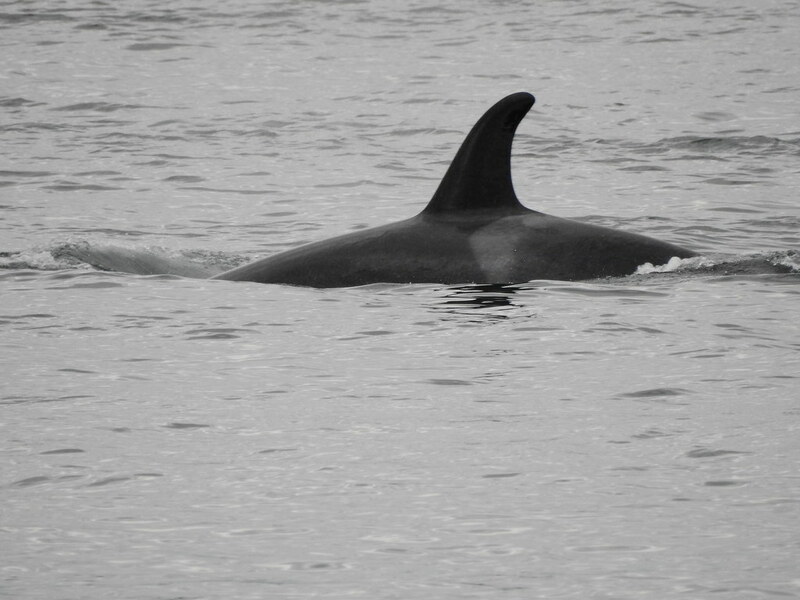 The mature male is “Echo” A55 of the A34 matirline. He was born in 1990. 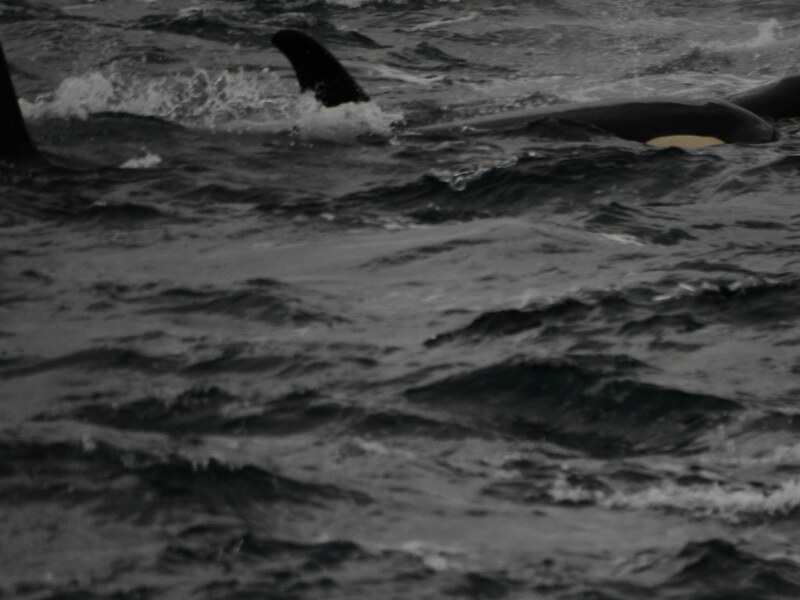 A younger or female Orca here. Looks like the same one with the rake marks. 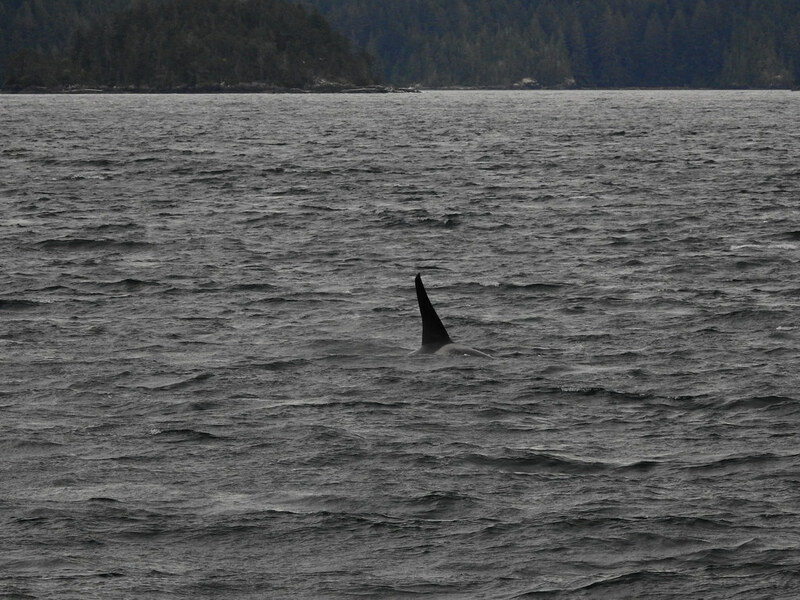 Jackie could tell who a lot of these Humpbacks were just by this tiny dorsal fin. She said they are like noses, & very distinctive. 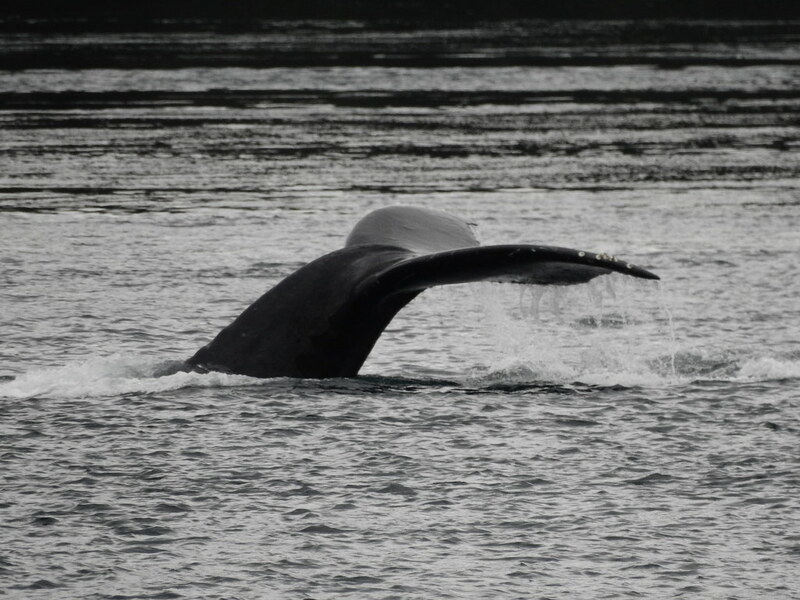 Those are barnacles on the tail, & they only grow on Humpbacks! 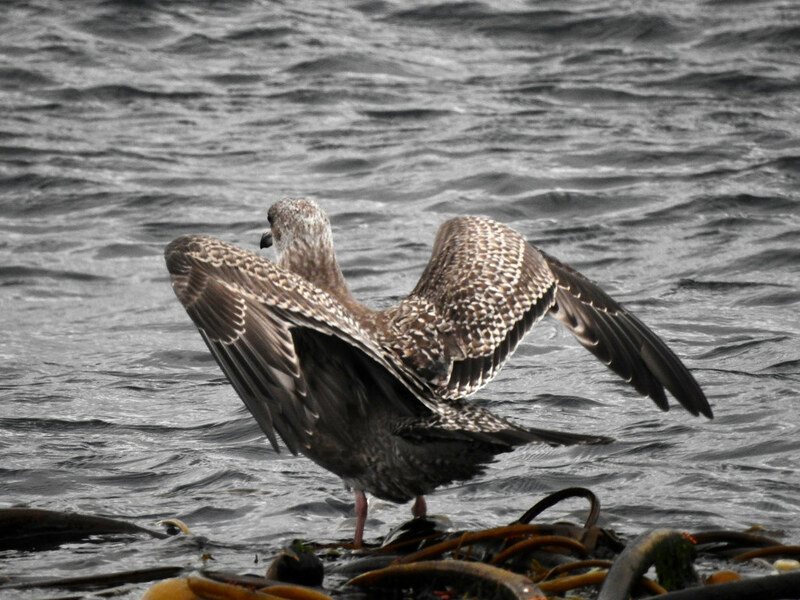 Looks like a youngster tail to the right! 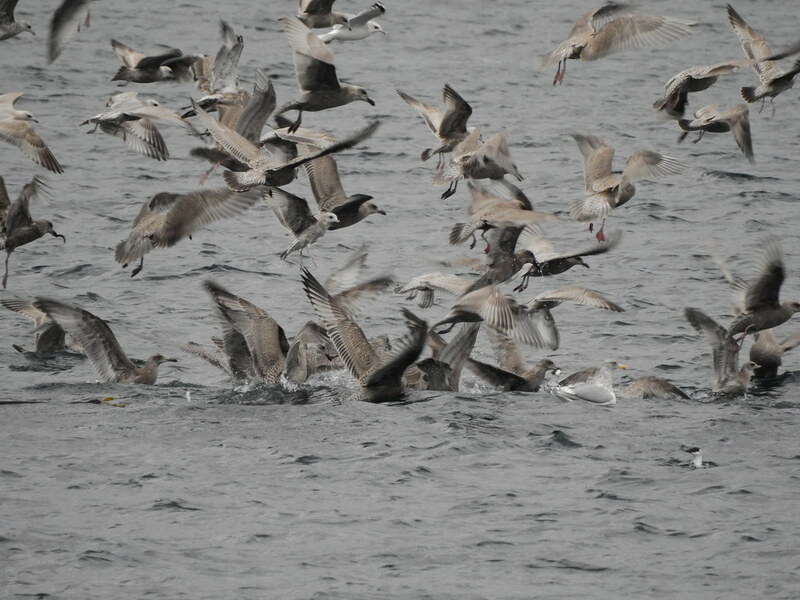 Gulls showing us where the feed ball is! We are told to watch these areas. 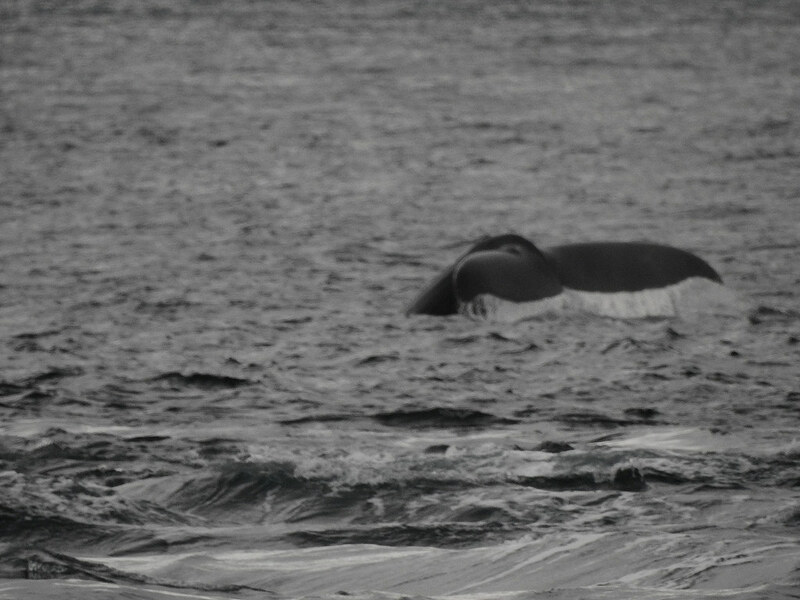 i would LOVE to catch a Humpback lunge feeding! There is a gap of one whole day between the 15 & the 17th, not one foto! i have to go back to the itinerary/map of that day to remember why. 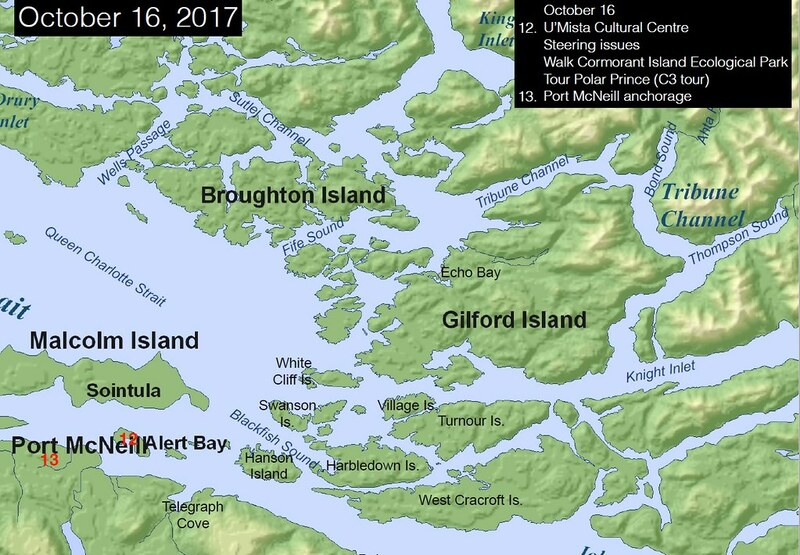 We anchored the night before off Hanson Island again, but in a different spot. i keep looking at a map, trying to figure out where we are but i don*t think i really got it til i got home & saw these fabulous itinerary/maps that Jackie made up for us. Another lovely night, with a fabulous dinner, & getting to bed late. i think this was the only night that i actually slept. i usually have a shower before bed, but i didn*t want to waste the water, i didn*t think it was necessary, & yet for some reason i was wide awake every night. On that night, we had finished our evening late, like 10 pm, which was another reason i couldn*t be bothered to have a shower, it was too late & would mean going to bed with my hair soaking wet. But on this night i had a shower & slept the best night of the whole trip. My bunk mate braided my hair for me, another reason i shower, because with the wind & all the clothing my hair just gets matted & tangled, & i need to comb it with conditioner to get out the knots. Now i felt i could go without a shower the rest of the trip, though i never slept after that night. Anyway, it was lovely to lie in the bunk & listen to the wind & rain & feel the boat rocking away. The boat is so heavy that she wasn*t much affected by the wind, which is a good thing, because i wouldn*t*ve wanted to be sea sick. 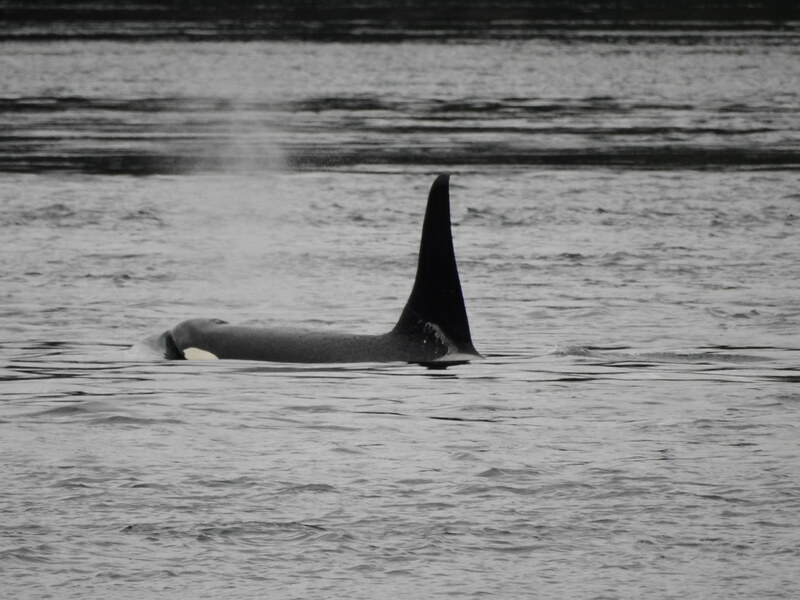 october 16 would have started with a lovely breakfast & the sounds of the minimal crew pulling up anchor & heading us out for out next destination, Alert Bay! This is a place i had heard of, but i had no idea it was an Island. It was discovered on this morning that we had a serious steering issue. Something like the air pressure was gone from what connected the wheelhouse to the engine, so the Captain could no longer change gears from there! It was necessary to send the Mate down to the engine room to shift gears manually. & it was necessary for the Captain to be able to talk to the Mate while he was down there. The walkie-talkies that they all carried didn*t always work. i think what finally worked was using their cellphones. So, a bit of stress for the crew every time we came in to anchor or when we headed out again! i think they took to anchoring out, even at the docks, as this was easier than trying to come into dock with the limping gear changing issues. 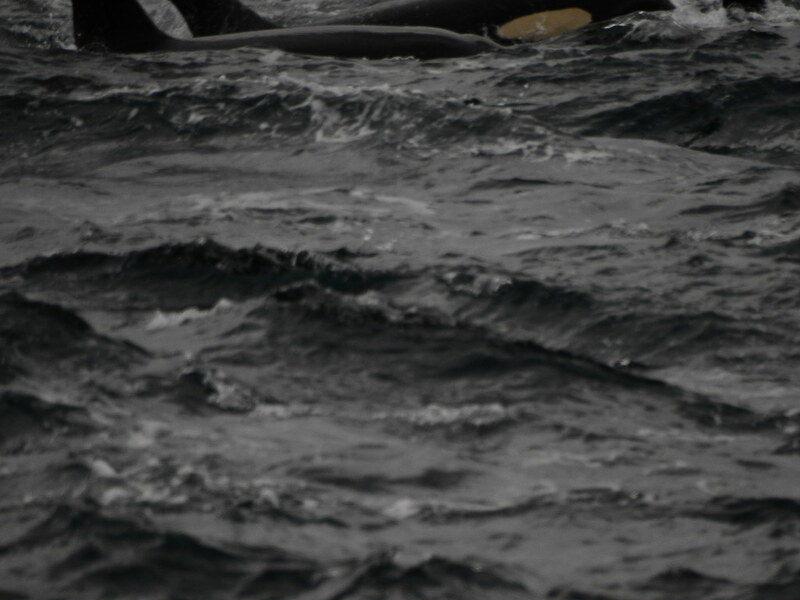 So we were probably taken to the dock in the zodiacs. i*m pretty sure it was a windy rainy dark day. We pulled into port & needed our rain gear for the walk to The U*mista cultural center. It wasn*t that far but i was hot & tired & sweaty by the time we got there. It was good to take all the layers off & rest for a bit. Normally the Center is closed on mondays but they opened it just for us, so we had the whole place to ourselves. 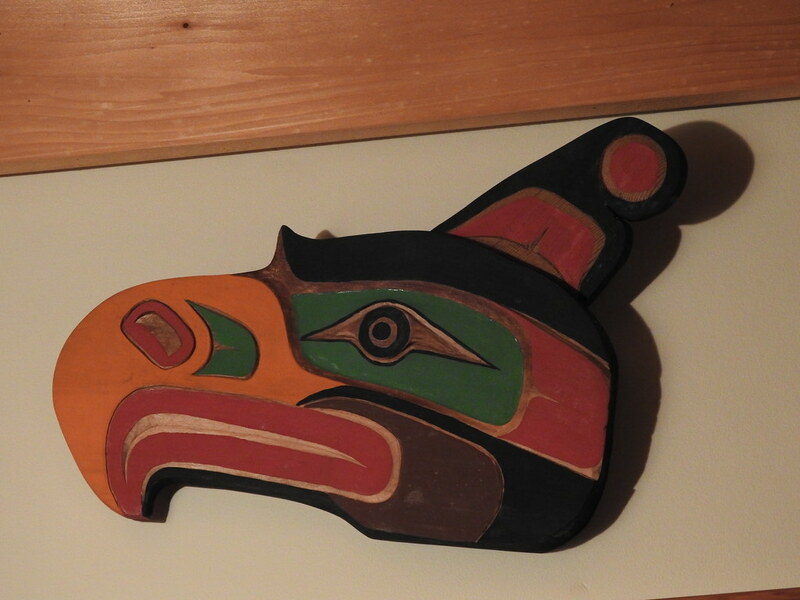 We were hosted by a lovely First Nations fella who told us some of their creation & history stories. 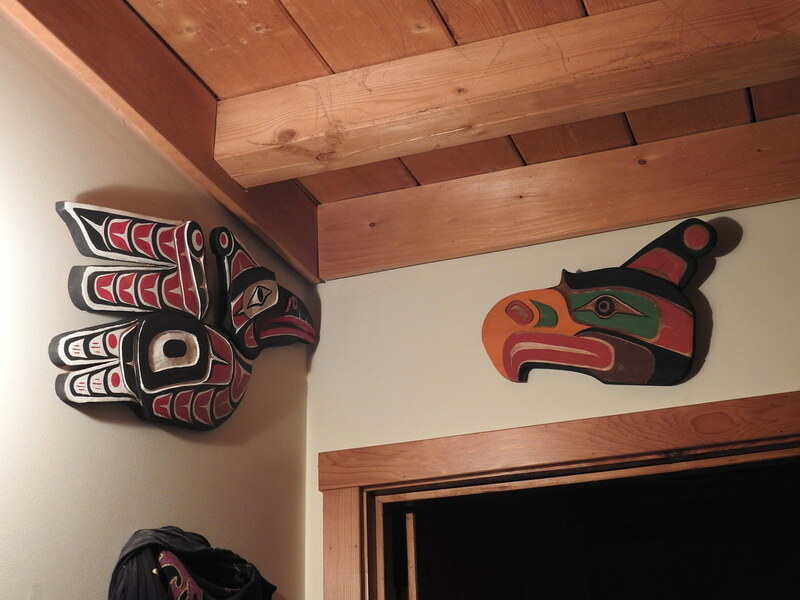 There was a short movie/documentary about the history of the Potlatch, wonderful! He then took us on a tour of the place, talking about some of the exhibits. 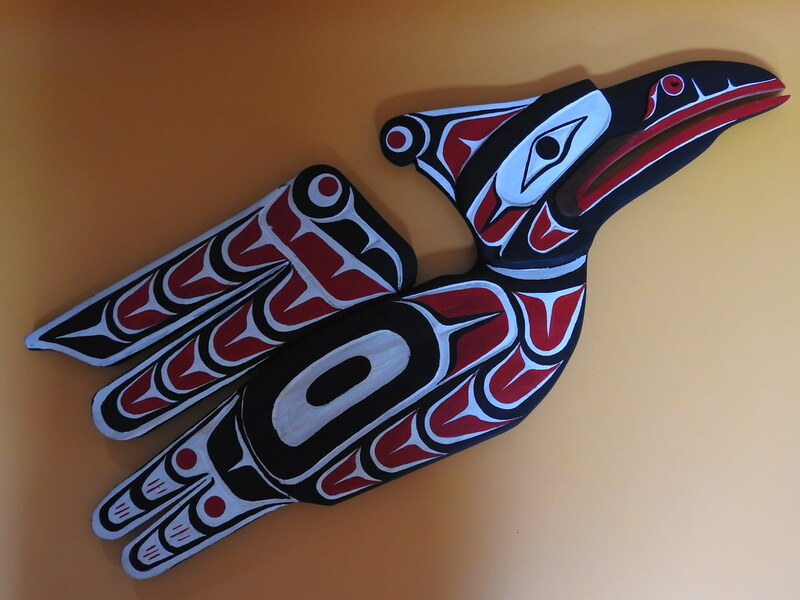 One exhibit was local children, they had been taken into the storage area where all the artifacts that aren*t on display are stored, & each child picked their favourite & said why, & there was a picture of the artifact & the child with their story. Jackie, who knew the lovely fella, said - tell them about so & so, now i can*t remember the youngster*s name. He smiled & told us about this young fella, who had trouble sitting still & they thought he wasn*t interested or paying attention when he chose the doorstop as his favourite treasure. Now why did you choose that, he was asked. Because the doorstop holds open the door to all the treasures!, he said. i think some of our group were losing interest a bit, so we were set free to go through the whole place on our own, but Jackie could see that my bunkmate & i were enthralled with the fella & his stories so we four sat down while he told us some more. This whole thing was the favourite part of the entire trip for me. It was wonderful in there. Our fella finally got called away & we were left to our own devices. But because we had sat while others were looking, we suddenly didn*t have a lot of time to look around. This First Nations group are very powerful. They have stood up for their rights & gotten back an astounding number of their ancient artifacts. The whole bottom floor was all these reclaimed items. The building was all wood, shiny wood floors & HUGE logs holding up the ceilings & spanning the length of the room. The lower floor is like being in a lodge house. Everyone else had moved on, we*d been brought cookies from the chef for our morning snack, weren*t we lucky?, & they were also checking out the gift shop, so i had the whole room to myself. Oh, wow, it was so wonderful in there, spending a bit of time with each artifact on display. i was transported to another time. i felt rushed, i*d wanted to take some fotos! We weren*t allowed to take fotos down there, so i just absorbed with my eyes. i only barely had time to go pee at one point, everyone was leaving, & on the walls were all these lovely carvings. Two jumped right out at me. i asked Jackie if this would be possible, to get these back onto the boat. She said she would make it happen. i wanted to support this wonderful place, that i hope to get back to one day, but it probably just wouldn*t be the same, full of tourists, we were so lucky to have the whole place to ourselves. So i bought these two as a thank you & a memory of this morning that took me a long way out of my world. This one jumped out at me for me.